A solar panel is defined as a silicon-based layered semiconductor module that can produce electricity from sunlight. Market Research Future (MRFR) has published a research report about the Global Solar Panels Market that anticipates massive raise for this market at 20.18% CAGR (Compound Annual Growth Rate) during the forecast period between 2018 and 2023. The imperative factors responsible for the growth of the Global Solar Panels Market are the increase in solar systems installations, generous government initiatives, and policies that support solar energy generation. Other factors supporting the market growth are future energy supply security, increasing investment in clean energy, and low operating cost of a solar power plant. Demand and hence, the market for solar panels is increasing due to the growing awareness about solar panel power generation being less polluting and producing fewer carbon emissions. However, the growth of the market can be hampered by increasingly stringent regulations on the land used for solar power generation sites and the low power generation capacity of the solar panels. On the Alps mountains, solar panels are being set up to increase the power production and compensate for projected energy shortfalls in Switzerland. Clifton Park town Planning Board has approved a 7-megawatt solar array for Sugar Hill. Proposed by Solitude Solar, this project will consist of approximately 20,000 panels positioned on 40 acres of land. The Global Solar Panels Market can be segmented on the basis of application, module type, technology, and lastly, region. The Application-based segmentation segments this market into commercial, residential, and utilities. By Module Type, the market has been segmented into crystalline, linear Fresnel reflectors, parabolic dishes, parabolic troughs, power towers, and thin film. Based on Technology, the market has been segmented into concentrated solar power (CSP) and solar photovoltaic (PV). 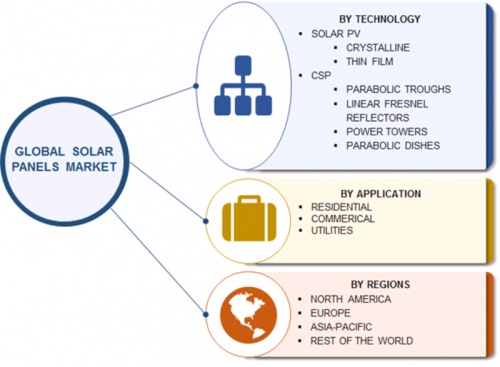 The regional segmentation of the Global Solar Panels Market has segmented the market into regional markets known as Europe, North America, Asia Pacific, and the rest of the world (RoW). Asia Pacific region is the largest regional market, and in this region, China is the biggest country-specific market. Throughout the forecast period, the Asia Pacific region is expected to dominate the global solar panel market. Factors pushing the market growth in this region include awareness about the advantages of solar panels, growing demand for solar panels, increasing industrialization & urbanization, population growth, and several ongoing & upcoming solar projects. Other important country specific markets in this region are Australia, India, and Japan, followed by the remaining countries of the Asia Pacific region. In North America and Europe, the market is growing due to strict government regulations to curb environmental pollution, growing technological advancements, and the presence of prominent market players. In North America, the important country-specific markets are USA and Canada. In Europe, the important country-specific markets are France, Germany, Italy, Spain, and the UK, followed by the remaining countries of Europe. The RoW segment covers Latin America and the Middle East & Africa (MEA). In Latin America, the strongest economies that have the potential to emerge as suitable markets are Argentina and Brazil. The MEA region has been expected to witness limited market growth during the forecast period. The market is expanding in this region due to poor countries, lack of awareness, lack of technological advancements, and lack of education.